Intex has launched it’s first Android Lollipop powered budget smartphone, the all new Intex Aqua Star L in Indian market priced at Rs 6,990 in Black and White colour option. Intex has recently launched Intex Aqua Power HD featuring 5”inch HD display, 13-MP+5-MP Camera, 4,000mAh battery priced At Rs 9,444 in white, black, blue and grey colour option. The all new Intex Aqua Star L supports dual-SIM (GSM+WCDMA), 3G, GPRS/ EDGE, Wi-Fi 802.11 b/g/n, Micro-USB, and Bluetooth offers you a a 5-inch FWVGA IPS Full Lamination Display with resolution (480×854 pixels) promising crystal clear view from every angle while latest Android 5.0 LolliPop OS and powerful 1.7GHz Quad-core processor capable of revolutionizing your multitasking. Aqua Power’s 1GB RAM, 8GB ROM and 32GB external memory allows you to store your favorite songs, movie and games. Intex Aqua Star L also offers you a 8-MP Primary camera with LED flash with Smart Camera Feature –HDR, Face Beauty, Panorma, Live Photo Mode,Continous Shot which allows you take a photo in low light condition and 2-MP secondary front camera for video calling and selfies. Intex Aqua Star L is powered by most powerful 2,000mAh battery with Smart features – Fast Charging comes in a dimension at 141mm x 72.9mm x 8mm promising Talk Time up to 5 hrs and Standby Time 220 Hours hours weight 130gm. 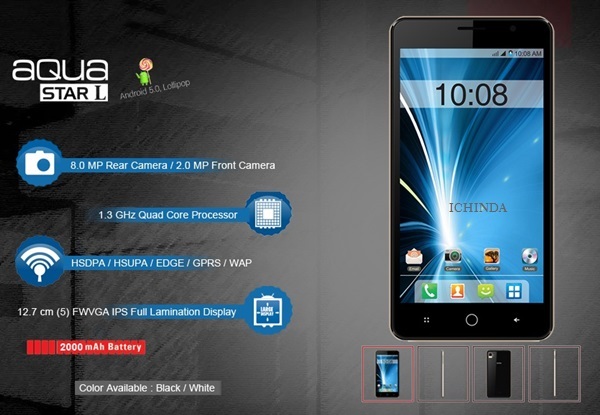 At last Few honest word, that all new Intex Aqua Star L is the best budget phone under Rs 7,000. What you think? Please be open to give your view.